Home Opinions	What does feminism look like in French? What does feminism look like in French? Language and thought are intrinsically linked. Our thoughts are informed by the words we use to describe them in ways that are difficult to measure and are easy to take for granted. The ways language fails to accurately describe reality has been a topic of interest for artists and philosophers for centuries. In English, there are certain linguistic norms and terms that have been criticized by new social movements. Contemporary feminists question the use of male pronouns as supposedly gender-neutral. In writing and speech, hypothetical people are usually referred to as ‘he’; a group of people—regardless of gender identity—are referred to as ‘guys’; and when speaking literally of all of humanity it is common to use the word ‘man.’ According to the Stanford University website, using male pronouns in a neutral way contributes to establishing men as the norm, and makes women seem out of place or even invisible in various contexts. Another problem in the English language is in the connotations the words ‘man’ and ‘woman’ conjure up. In her book The Man of Reason, Genevieve Lloyd points out that chaos and danger tend to be associated with femininity, while order and reason tend to be associated with masculinity. Such representations of gender permeate contemporary media (think of detective films, where a femme fatale character threatens to undo their reasonable male counterpart), and they work their way into our language and thought in discreet and insidious ways. There are many more ways that feminists are concerned with faults in the English language (for a comprehensive outline of various arguments in the field, I recommend checking out the “Feminist Philosophy of Language” page on Stanford University’s website, which I quoted earlier). But what does feminism look like in other languages—particularly gendered ones? 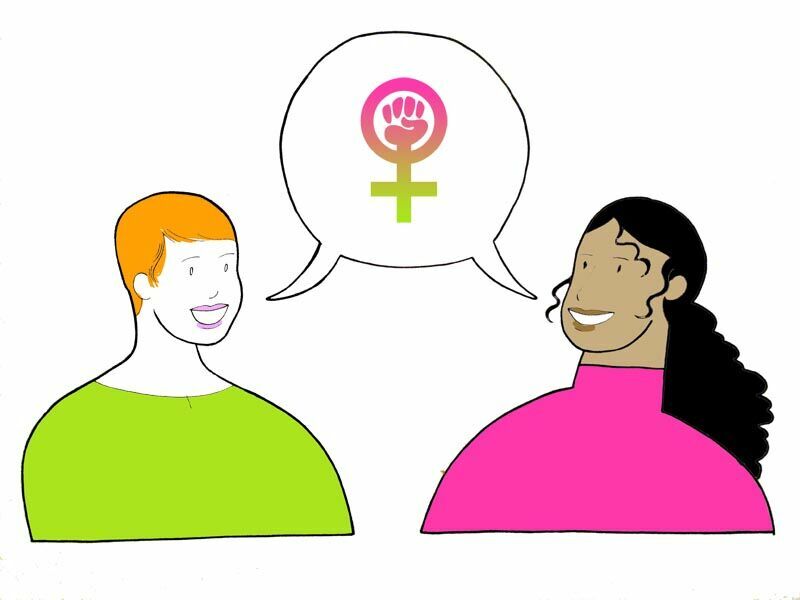 I spoke to Christine Delmar, a councillor on female empowerment for the company Les 7 Directions in France, to hear about her perspective on feminism and the French language. In French, the verbs, adjectives and adverbs used are dependant on the gender of the noun that they are applied to. Delmar noted in our conversation that one of the first things children learn when they are learning how to speak French is that “masculine wins over feminine.” This is like the ‘masculine pronouns as neutral’ problem in English I mentioned earlier, in that it obscures women and strongly implies that they are inferior or subordinate to men. “Learning of masculine dominance in school has a significant impact on the subconscious,” Delmar said. For certain job titles, it is more common to refer to them in the feminine or the masculine, depending on the type of work and the gender they are traditionally associated with. When gender is unknown, doctor is masculine (docteur) whereas nurse is feminine (infirmière), which reflects and reinforces gender stereotypes. This makes anomalies in these fields stand out even more, and works to maintain rigid gender norms and stereotypes. In the fall of 2017, a French textbook advocating for gender-neutrality in language was released, according to The Atlantic. It has sparked a lot of heated debate, as many fear that a move towards making French gender-neutral would ruin the beauty of the language. However, the reality is that language is constantly changing, and we should try to make it change in a way that can more accurately represent society by including minorities and marginalized groups. Gender-neutral language would be a step closer to a fair society, and I think that is well worth the effort it will take to achieve it. Perhaps English—a language that is naturally more gender-neutral—can purge itself of unnecessary and arbitrary gendered words or concepts to be more inclusive. This could act as a model for other languages in the global advancement towards inclusive language.